I knew the day was coming. I knew the syrup man from Possum Trot couldn’t live forever. But as sure as the seasons change, life moves on. My friend Willie Swindle is dead at 103. My late next door neighbor Ruben Smith first introduced me to Mr. Swindle. Ruben was my first cousin, twice removed, and was married to my double cousin Evelyn. Ruben taught me how to grow sugar cane for making syrup. This would have been sometime in the 1990s because I remember coming back home from LSU with some stalks of “Louisiana blue ribbon cane” to plant. Like all my relatives before me, I grew up eating ribbon cane syrup out of half gallon tin cans. My dad still loves it. Most these days don’t however…too strong they say. All the country people before us did because it was their only source of sweetener. Sugar was expensive, hard to find, and even harder to make. 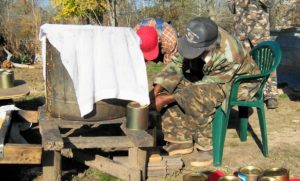 Making molasses, or ribbon cane syrup as it’s called here, was something at least one industrious Southern farmer and his wife in each community could pull off. My paternal grandparents, Jake and Dee Smith, had a syrup mill on what is now my dad’s property nearby. Usually the syrup maker didn’t have to grow their own sugar cane as they’d take their syrup out “on the halves” (or some other arrangement) for producing it. Today one thinks of molasses possibly for making tasty baked beans or in my case the single tablespoon I use when making homemade Rustic Italian bread. But several generations ago ribbon cane syrup meant sopping buttered biscuits, cookies, pies, pop corn balls, taffy pulls, and syrup candy with peanuts. 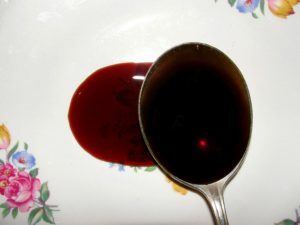 My Grandmother Emanis would make us syrup candy in an old pan and we’d scoop it out by the spoonful to gorge on. I think the only ingredients were butter, ribbon cane, and raw peanuts, cooked until gooey like soft taffy. Ribbon cane syrup was a sugar replacement and stored by the buckets and barrels after production each year. My dad said each year when a hog was killed he looked forward to a plate of eggs, fresh ribs, and biscuits all covered with ribbon cane syrup. Sugar cane is a tropical grass and is the source of much granulated sugar in the world. Sugar beets are used for this purpose in colder climates. 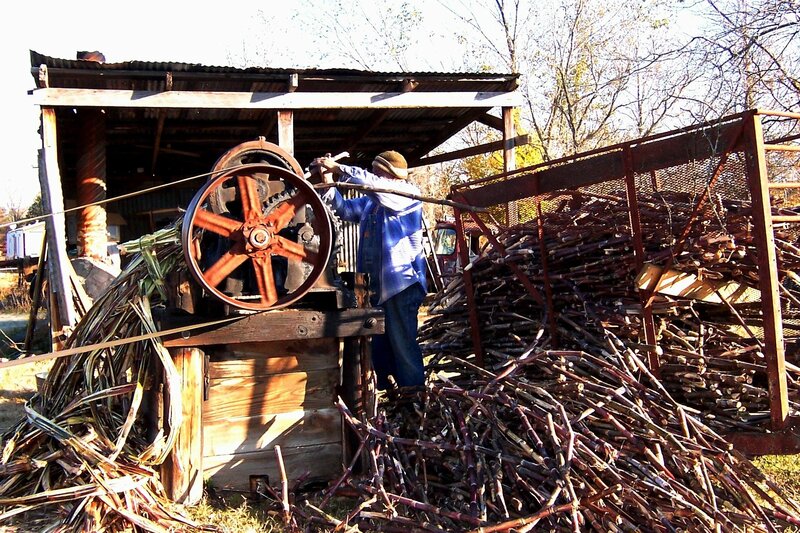 Each year after the sugar content rises in the fall, the stalks of sugar cane are harvested and squeezed for their sweet sap, generally between Thanksgiving and the new year depending on when the first hard killing freeze is. The cooler the temperatures get, the sweeter the cane gets. However, a killing freeze will ferment the cane leaving you rum on your hands! The ever dwindling selection of soft-stemmed, heirloom cultivars grown for syrup is different from the hard, tall types produced for sugar by the way. Mr. Swindle learned how to make syrup from his parents. He cooked it the old fashioned way, in a batch pan, instead of a more modern evaporator. Cane juice is about 90% water, so after cooking most of a day the end product is a thick, strong tasting, sweet, brown molasses. Some of the local ladies would come and purchase the un-cooked juice from him which they’d keep in the ice box for holiday sipping. If you’ve never had fresh cane juice, it tastes like a liquid combination of sugar, grass clippings, and aluminum foil. I kid you not. I like it though. Anybody raised by wolves would. In the old days, kids would drink so much they’d literally run to the bathroom! Willie Swindle lived in a little shanty of a house near the Sabine National Forest in eastern Shelby County. Some call it the New Harmony Community, but I knew it as Possum Trot. 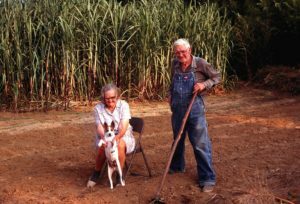 In addition to a small patch of sugar cane each year, Mr. Swindle’s rustic farmscape sported horses, cows, donkeys, goats, chickens, and hound dogs. One year he’d just washed a bunch of fruit jars to put the syrup in and placed them behind his house to dry. When I showed up there was a litter of hound dog puppies sleeping between all the clean jars. Cane squeezing started early in the morning, generally with the help of one of his sons, Bishop Zephaniah Swindle, and myself. One morning Mr. Willie walked out of his house with a dry bowl of cereal, stopped next to a milk goat, squirted it with fresh milk, then sat down to eat his breakfast…country living at its finest. “no thanks.” Then the ninety year old wood sprite put it in neutral, pushed it down the driveway, hopped in, popped the clutch to crank it, and was off to the other side of the county. That’s what hard work and lots of dancing will do for you. He was one amazing fellow; always nice to me. I’ll sure miss him. 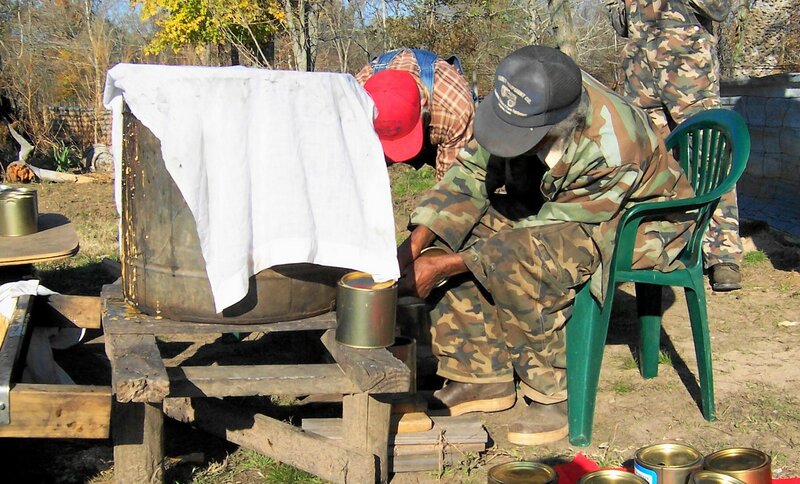 There will never be another Willie Swindle, but if you’d like to witness the syrup making process, the city of Henderson hosts the Heritage Syrup Festival each year on the second Saturday in November. For more information go to: www.depotmuseum.com/syrupfestival.html. What a lovely tribute to a cherished friend. I hope he has family or friends to carry on the syrup making tradition. 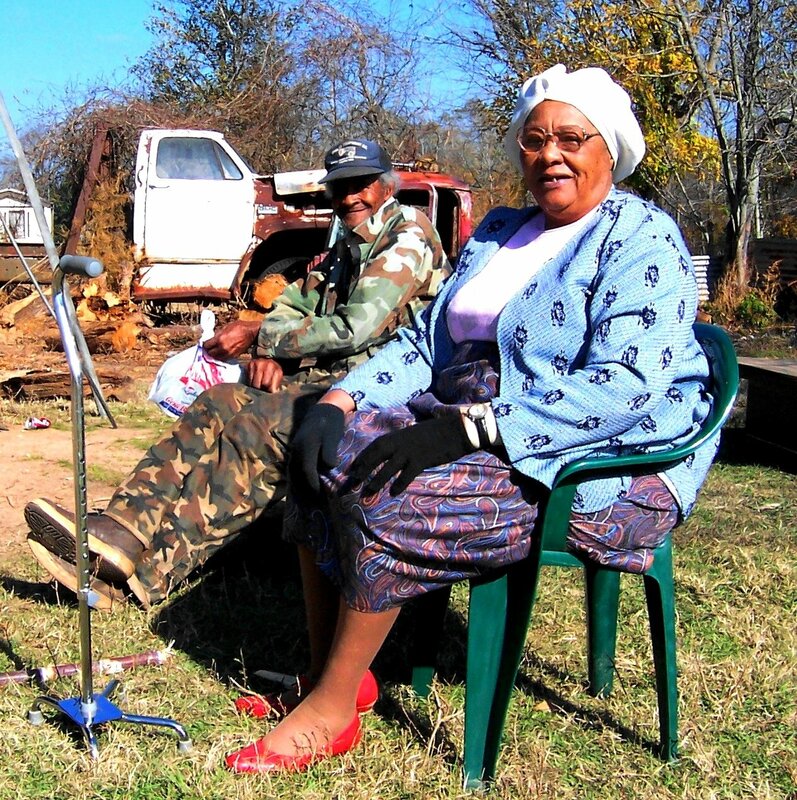 One of my favorite memories from childhood is a visit to the cane syrup makers who lived down by the Brazos River. My grandparents had a small farm at Sandy Point, just off old Highway 288, and we drove down the winding road to a place near the Brazos to watch the syrup making process. 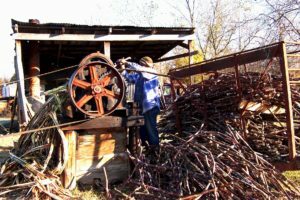 What I remember most is that they used a mule driven press to crush the cane and extract the juice. I was in Possum Trot in the 80's with Momma to watch the syrup making. Her cousin Mr. Scarbourgh was there and it looks like the same place that the picture is of. I made lots of pictures of them and the mule driving the press, making the syrup and stoking the fire in a long brick oven?? with a large shallow pan on top - steam rising from the syrup. My grandfather lived on Bayou Blue, grew sugar cane and made syrup every fall (of course that was long before I was born). Being raised in Goober Hill, Possum Trot was only 5 or 6 miles up the road. Now I'm hungry for hot homemade biscuits with butter and some ribbon cane syrup. Greg, enjoyed this Blog so much, brought back some long ago memories. My husband's father knew Mr Swindle since they lived in that part of Shelby County. If you were coming from Center, turn at Aiken going down your road to Arcadia, just about a mile there on the ,left at the end of a narrow, hillside road was a Cane Mill. I've forgotten their names, but you reminded me of the great days we would go there and us children always got too much cane juice. But when the opportunity came again, we kids were ready. Thank you for the kind words and memories reflecting on my uncle Willie Swindle. 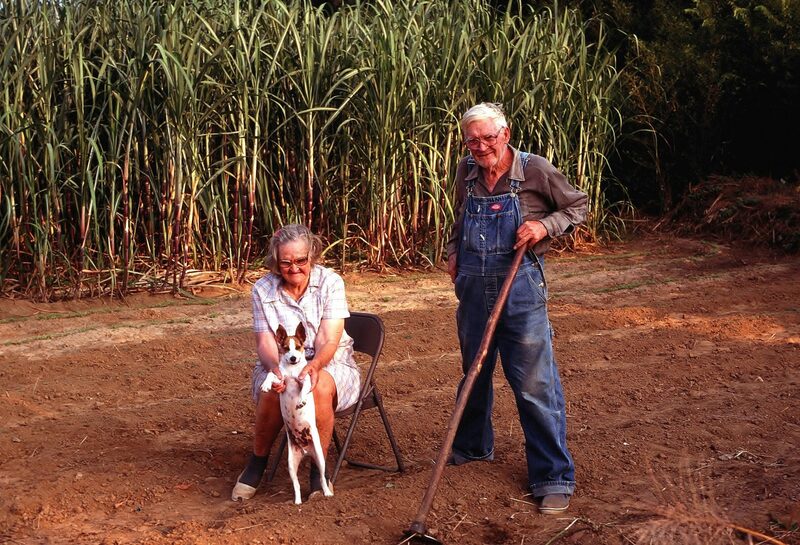 A Good man that carried on a family tradition of making sugar cane syrup for many years. Growing up in the Houston it was very exciting to come down to Shelbyville and watch uncle Willie prepare and make the syrup. He was loved beyond words and is truly missed by our family and this community .